Thai Binh (VNA) – Novel approaches to reducing greenhouse gas emissions and increasing rice yields will be introduced through the AgResults Vietnam Emissions Reduction Pilot (AVERP), the first phase of which was launched in the Red River Delta province of Thai Binh on August 22. The AVERP project, managed by the Netherlands Development Organisation, aims to set up, pilot and multiply technologies, tools and advanced rice cultivating methods to promote sustainable rice production. It aims to improve livelihoods for some 75,000 farmers in the Red River Delta region, cut 375,000 tonnes of Carbon dioxide emissions and reduce 15 percent of input costs for farmers. 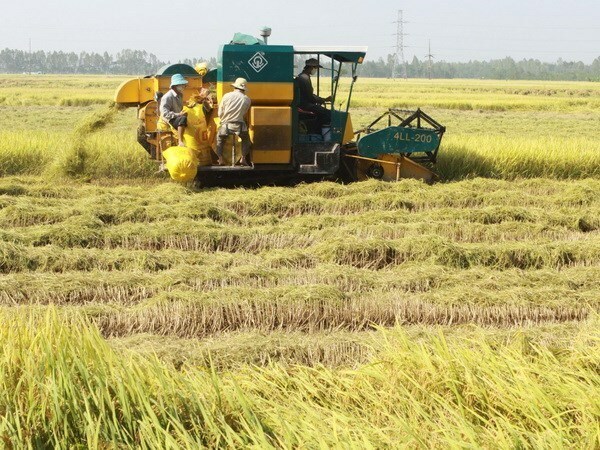 The two-phase project, set to be carried out in Thai Binh during 2016-2021, welcomes initiatives from local organisations to develop technologies in rice farming. To date, it has attracted entries from 24 organisations. Its first phase consists of two crops, starting from the summer crop of 2017 to the spring crop of 2018. Participants will test their technologies during the two harvest periods and those that develop effective technologies and solutions that reduce greenhouse gas emissions will be selected to join the second phase. The second phase has four consecutive crops and will begin from the spring crop of 2019 and finish in the summer crop of 2020. According to Rodrigo Alberto Ortiz, Team Lead of the AgResults Secretariat, it is important to implement the project in Thai Binh province, which is famous for its agriculture. Solutions which were effective in this project can be expanded to other parts of the Delta and the country, he said. The AVERP has a total funding of 123 million USD sourced from Australia, Canada, the UK, the US and the Bill & Melinda Gates Foundation. It aims to encourage agricultural initiatives that enhance food security and benefits of farmer households.